I also purchased the String Spacing Rule (this time from Stew Mac) that is simply incredible. Click here to go to the product page and view the video on how this thing works. It really is a time saver and makes it easy for even a novice like me to cut a perfect nut the very first time! Awesome. I also bought a bulk of six "Slip-Stone" nut blanks from Stew Mac... Slip-Stone is my favorite nut material. It has a more mellow sound than bone, but it cuts easily and is extra "slippery" making it perfect for tremolo equipped guitars and players that bend a lot (I fit both categories). It also has a cream color instead of black like Graph Tech, so these are great if you prefer the appearance of the original stock plastic or bone nut your guitar came with. Armed with these tools, a sheet of 180 grit and 1500 grit sandpapers (plus my trusty Dremel tool) I was able to fashion a nut for my Music Man Sub1 out of a Slip-Stone blank. 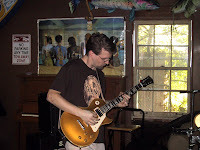 I started by loosening the strings on the guitar and laying them off to each side of the neck. I then lightly tapped the old nut out with two screwdrivers... one with the handle end on the end of the nut like a chisel, and the other to tap the screwdriver held in place. The nut loosened and slid out of the slot a tad bit and I then was able to get it out completely by pulling it like a "tooth" with a pair of needle nose pliers (it did break in half in the process, however). Once the old nut was free I was able to examine it carefully and use it as a template to copy for my new nut. ;) I thoroughly cleaned and trued up the neck slot with sandpaper to remove old glue, lacquer and any other debris that might prevent my new nut from fitting snugly. I started sanding on the nut blank to reduce thickness (so it would fit in the slot on the guitar neck) by laying the blank down flat on my 180 grit sheet of sandpaper and sanding it evenly (I double-sticky taped the sandpaper to my workbench for a makeshift sanding block). Once I had the thickness reduced enough for a nice tight fit in the slot, I then laid the old nut on top of the blank and marked in pencil how much to sand off vertically to get the overall height of the blank down closer to that of the old nut. Once the overall height was reduced I placed the blank back on the neck and made sure it was pressed firmly and evenly in the slot. This neck slot was curved to match the neck radius of 10"... so I needed to add that curvature to the bottom of the nut in order for it to fit properly. So, with the blank firmly and evenly pressed in the slot, I drew the neck radius right onto the nut using a pencil. This gave me the exact shape I needed to sand away the excess from the bottom of the nut to create the curve. I used my Dremel tool for this and it worked beautifully. Once I was done I cleaned and trued up the Dremel work with a small sheet of 180 grit sandpaper followed with 1500 grit. I had a perfect radius that fit the slot exactly! I was now ready to mark the string slots. Here is where the Spacing Rule I just bought saved me the aggravation of marking slots with formulas. I marked my two E strings at the recommended 1/8th inch measurement from the two outside edges of the nut. I measured and discovered that this is where the previous nut had the two E strings slotted, as well. Once this was done I lined up the ruler marks until I found a set that matched my outside slots, and then I marked the four inner strings with pencil... perfect string spacing! :) How easy was that? From here all I needed to do was slot the marks with my new nut files and then take up any remaining nut length so I didn't have any overhang... then I Dremel'd down the height and shaped the nut until it looked attractive and had a nice form. All this was very quick and easy work. Caution must be taken when cutting slots, however, as it is very easy to over file a slot and ruin a nut. And believe me, after doing all that work you'd be very upset if you got all the way to cutting slots and then ruined the nut by going too deep! ;) After the nut was completed and I tested the strings in place and was pleased with the spacing and slot height, I placed three small drops of water diluted wood glue in the neck slot for the final bond. I pressed in the nut and placed the remaining strings (that hadn't broken in the process) into their respective slots and tuned them up to keep pressure on the nut while the glue set. 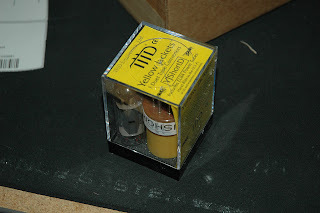 I had an Eminence Legend GB12 8 ohm speaker just laying around from when I had my Blues Jr. amp. I ended up selling that amp, so I had this speaker stored in the closet doing nothing. ;) I figured I could buy another one and experiment with these in my Bogner 2x12 cabinet. It came loaded with Celestion Vintage 30's, which are notoriously harsh and "fizzy". The Legend GB's are voiced similarly to the classic Celestion Greenbacks, which are warmer and less harsh than Vin 30's. So I figured I'd give them a try in my Bogner to see if I liked them. I soldered them in wired parallel. The old speakers were 16 ohms each wired in parallel for a total load of 8 ohms. The new Emi's are 8 ohms each, so wired in parallel the cabinet load now totals 4 ohms. My Boogie has one 8 ohm speaker out jack and two 4 ohm speaker out jacks. The Boogie does prefer an 8 ohm load when possible, but it can and does run comfortably on a single 4 ohm load. The first thing that struck me about the sound of the Eminence Legend GB12's was the total elimination of the fizz I had been hearing in my Mark III since I bought it (this includes using the amp's own preamp distortion, as well as the Jekyll & Hyde pedal!) . It turns out that this fizziness was, in fact, caused mostly by trebly and harsh speakers, not so much by the amp itself. I only wish I had known this 16 years ago. ;) The Legends have a nice round, warm tone to them with a good fat low end that, surprisingly, does not bottom out with high gain riffing. I actually found that I needed to add treble via the Mark III's graphic EQ, whereas before I always needed to cut those frequencies. I also hear a very different and distinct midrange tone... very "wood" like. 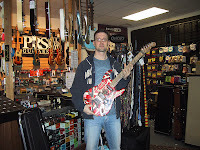 My buddy, Nik, bought a used Ernie Ball Music Man Sub1 recently at Guitar Center at a blow-out price of $200. It was in rough shape (mostly dirty) and was in dire need of a new nut and a good setup. I agreed to help him clean, repair and set it up, so he bought it. 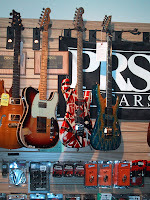 These guitars have been discontinued by Music Man because they were having trouble making a profit at the low prices they were selling them for (around $600 -$700 street price new). After cleaning the guitar thoroughly and getting some fresh strings on it, I realized just how good these guitars are. 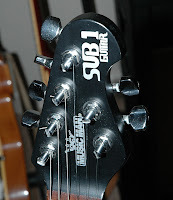 The Sub1 line was made in the USA and they sport some pretty fantastic necks, very reminiscent of the Silhouette Music Man models. The stock pickups sound great... this particular model is the dual humbucker version with Music Man "vintage" style tremolo. The tremolo works unbelievably well, and with a new nut it will be even better. The trem versions of the Sub1 even come with locking tuners! I had to order a new trem bar because the previous owner lost it, no doubt. Other than that there is nothing else to buy or replace on this guitar except the nut. This will be my first foray into nut making, but I am ready. I have some nut files on order (they should arrive today, in fact), and I have also purchased various Stew-Mac rulers and other goodies to facilitate the procedure. I'll get the whole process up on the blog as soon as I can. Learning the art of nut making will be a big step for me in becoming my own completely independent guitar tech and repairman. I have decided to buy this guitar from Nik, since I feel that it will be a great "beater" guitar to take places where I'd be concerned about having some of my nicer gear with me. It plays and sounds every bit as good as my higher-end guitars. My only complaint is that the pickguard feels a bit rough to the touch. I may replace it with a Silo pickguard at some point, if it will fit. Otherwise, I am very pleasantly surprised with this guitar (especially for $200!). No, I didn't actually buy it. :) I wish I could have, though. This thing was awesome to behold... an exact replica of the guitar that the man Himself made. It was stunning to see all the detail that they were able to put into this thing... and what stunned me the most was just how "real" and "frankenstein" it looked in person. I think most of us are used to seeing this guitar in photos of Eddie playing, posing for ads, etc. But to see this guitar in person it literally looks like a cheap, slapped-together piece of crap (and it is!). 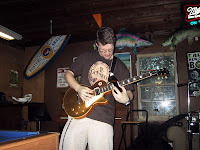 And that is one of the many inspirations of Eddie Van Halen on my playing. That he could actually put together a guitar made of cheap, second-hand parts and still play like a virtuoso on it is a testament to skill and talent over quality of instrument, or "name brand" labels. If you're good you can make music on anything. 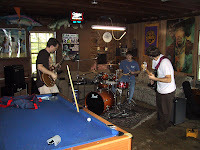 Well, we had so much fun the other day that we decided to get together one last time in the garage before Mike had to head off to college. This time I took my wife and my Tele with me... and my neighbor, Dan, and his son, Bryan, showed up as well. It was shaping up to be a lot of fun. 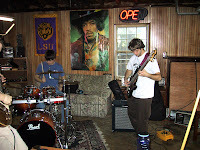 The bassist, Nick, was way late so Mike and I set up and started playing a little bit to warm up. We ended up jamming out some pretty cool stuff while waiting for Nick. I thought I'd try out these Yellow Jacket devices I've been reading about to see if I could tame the Mark III beast of an amp I have here. ;) They work pretty well, but if your amp is loud it is going to be loud no matter what. These helped a tad on the volume, but mostly what happened was a tone change. What the Yellow Jackets do is step down the power from a large, 6L6 or EL34 socket to an EL84 socket. I liked the sound of my Boogie running on EL84's, but as you would expect they do tend to distort rather quickly. Nice to have for certain applications, but not something I'll be using often. I jammed yesterday with Mike McGowan and Nick Clark. Mike is a very good drummer and best friend of my next door neighbor's son, Bryan. 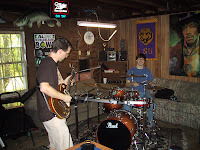 He has come over to jam in my little home studio many times in the last year and a half, but this time we were jamming in his mom's garage. ;) Nick is a very talented bass player with excellent chops and very tasty note choices. I was very impressed. Our audience consisted of my neighbors, Dan Chianella, and his son, Bryan. We basically just messed around with free-form jams, funk and we even butchered some covers for fun. 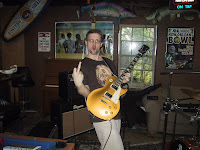 I played my R7 Les Paul through my Boogie amp and Bogner cab with the Jekyll & Hyde distortion pedal and it rocked. I have never sounded better. ;) Got lots of compliments on my tone, both clean and OD. Overall, it was a lot of fun and I hope to do it again soon. We had great chemistry despite our rather large age difference. ;) Mike attends a college that is located in a different part of the state, so playing regularly with him will not be possible. I do, however, hope to get together more with Nick in the meantime to collaborate on some originals and just jam. Perhaps we can get a band together this summer and play out now and then. I would really enjoy that. 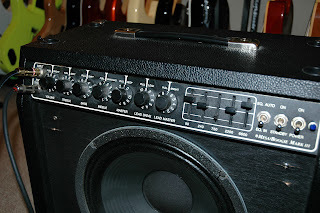 After doing some research online I discovered that Mesa Boogie will build custom order head shells for Boogie owners. Very cool! So I ordered a black tolex Mark III head shell for my combo that I have been wanting to convert to a head. I should get it in about 4 to 6 weeks. Well, it happened again. I walked into Guitar Center with my buddy Nik with no agenda and I end up buying another damn guitar. 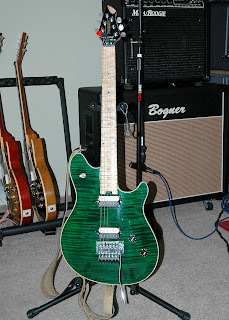 :) This time a used USA Peavey Wolfgang Standard (artchtop) with a lovely green flamed maple top. I was hanging out with Devin and my buddy Nik while playing a Gibson Explorer that Nik was interested in when the Wolfgang was thrust into my hands by Floor Manager, Lee. 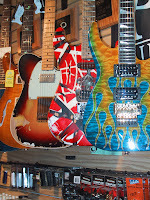 Previously, there had been another Wolfgang Standard in the store with an amber top, and I was told that the owner of the green one decided to do a straight trade for the amber. According to Lee, this guy kept the guitar in the case most of the time and as hard as I have looked I can't find any real damage, dings or major scratches in the finish. The fretboard is slightly stained, but that is par for the course on these guitars as they have unfinished, oiled necks. The only problem with the guitar is the D-Tuna drop D mechanism. It is missing the set screw needed to adjust the fine tuning when in drop D. I decided to remove the D-Tuna altogether since I rarely ever play in drop D and don't plan to make a habit of doing so. If I am ever in a band that requires a lot of drop D, I'll consider getting it fixed and popping it back on. I setup the guitar after thoroughly cleaning the neck and body. The necks on these are basically unfinished maple with a light hand-rubbed oil to seal them and protect the wood from moisture. This oiling process needs to be repeated from time to time (about once a year, depending on how much it is played). I did a basic fret polish and cleaned the board with Murphy's Oil Soap, some 0000 steel wool and elbow grease. :) I wasn't able to get all the stains off the neck, but the next time I restring I'll do a more comprehensive cleaning and re-oil the neck. At this point I wanted to get it "sanitized" and clean enough to evaluate how it well played. I applied some 3M Fine Cut polish to the body and vigorously rubbed out as many scratches and spots of filth as possible. The finish shined up beautifully! Almost as if it were brand new. The pickups are super hot with a great metal/rock tone. This guitar is not for Jazz or Blues, but playing with the volume knob you can get it to clean up admirably well. So with a little practice you can get it to do some pretty diverse stuff. Speaking of knobs, I replaced the cream volume and tone knobs the guitar had on them with black ones, just like the stock guitars have from the factory (from some reason the original owner changed them to cream). I decided to leave the cream switch tip as is, since it looks good (but those are black from the factory, as well).